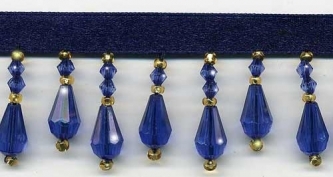 From our Beaded Drop Collection: This beaded fringe trim is a beautiful and rich shade of royal blue, almost a cobalt blue. The colors are translucent blue faceted teardrop beads with seed beads in gold. It is incrediably beautiful! This is a high quality, very full beaded fringe with exceptional detail and craftsmanship. The longer beaded stands are 1" long, not including the rich blue satin ribbon. Perfectly stunning!